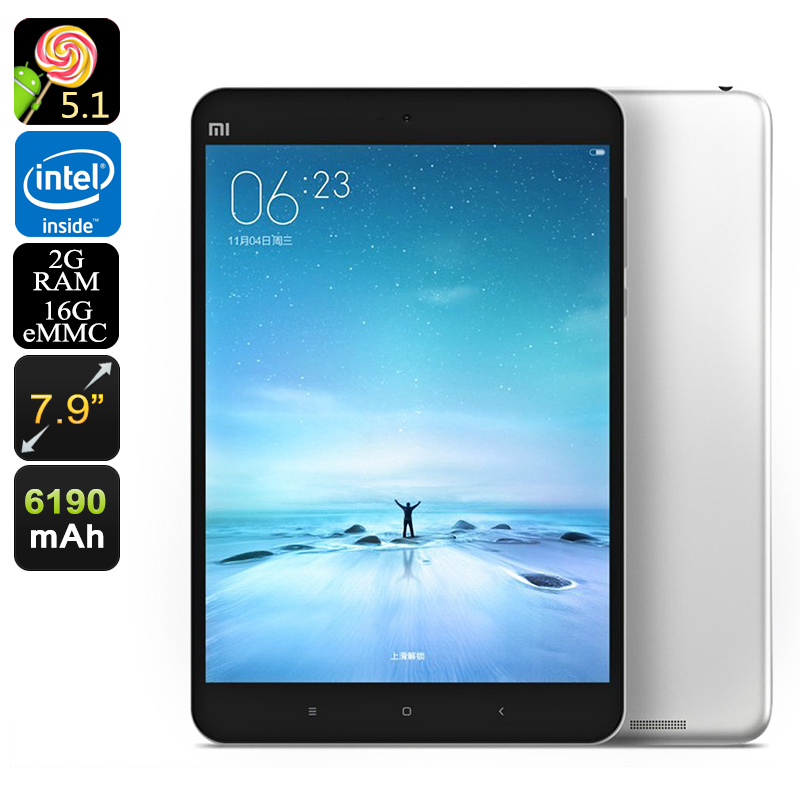 Successfully Added Xiaomi Mi Pad 2 Tablet PC - 7.9 Inch Retina Screen, OTG, Dual-Band Wi-Fi, 6190mAh Battery, Quad-Core CPU, 1536P (Silver) to your Shopping Cart. Enjoy countless hours of fun and entertainment with the Xiaomi Mi Pad 2. With its sleek and ultra-light aluminum design, this tablet is barely 6.95mm thick yet features some powerful hardware to guarantee its users with an explicit user experience. Download the latest Apps, play high-end games, and enjoy FHD movies in their finest detail – the Xiaomi Mi Pad 2 handles it all without dropping a single frame. Featuring a Quad-core CPU that has been clocked at 2.2GHz and 2GB of RAM this Android tablet is capable of handling the most demanding of situations. Along with its Intel HD Graphics card, the Xiaomi Mi Pad 2 lets you enjoy all your multimedia in its finest quality. Play the latest games and enjoy their incredible special effects on a large 7.9 inch 1536p display. Portraying nearly 1.5 times of 1080p resolution this Xiaomi tablet brings all your multimedia to life, truly enhancing your mobile entertainment experience. With its OTG feature, you can furthermore connect an external hardware device such as a keyboard or game controller to your tablet, allowing you to take your overall user experience to an entirely new level. Watch your favorite movies and series anytime and anywhere in stunning quality and sharpness with the Xiaomi Mi Pad 2. Offering a wide range of video applications including Xiaomi App Store, and many more this Android tablet offers you the perfect platform to enjoy countless hours of free media entertainment. Along with its massive 6190mAh battery, you will not run out of power anytime soon. Offering up to 12 hours of continuous usage time this Chinese tablet allows you to watch numerous of movies in a row without the need of recharging. Holding up to 16GB of internal storage you no longer have to worry about running out of storage space anytime soon. Whether you stream your favorite movies online or download them onto your tablet, the Xiaomi Mi Pad 2 offers a significant storage space enough to safe days worth of media content. The Mi Pad 2 is equipped with the newest generation of wireless technology offering mesmerizing data transfer speeds. Numerous times faster than its predecessors Dual-band Wi-Fi lets you stream online movies and download files in the blink of an eye. With its Dual-band Wi-Fi connection lag and interruptions while browsing the web will be a thing of the past. The Xiaomi Mi Pad 2 comes with a 12 months warranty, brought to you by the leader in electronic devices as well as wholesale electronic gadgets..